Low inventory notification based on realtime roasting data! Managing green coffee inventory is as much art as it’s science. Maintaining the right balance of inventory to satisfy your production needs without taking up precious roastery space or putting excessive pressure on finances, can be a juggling act. At RoastLog we’re constantly looking for even the simplest way to help our users find that balance. 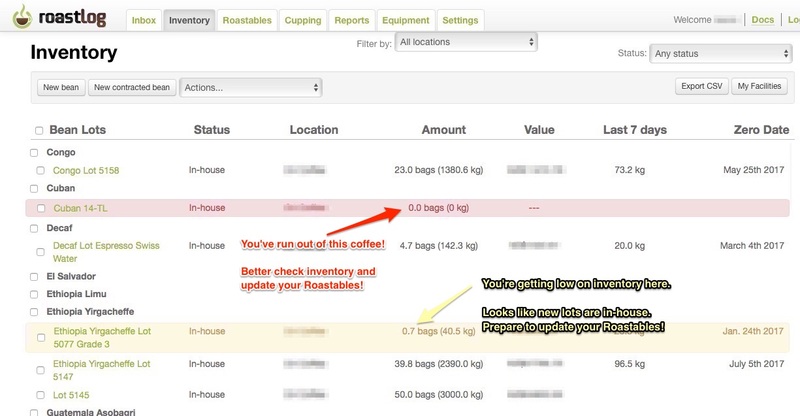 From the inventory page, users get a visual cue for coffees that will likely run out within the next week (yellow highlight) or are at critical levels and need to be addressed (red). At-a-glance – time to check onsite stock! This is the first of many notification tools coming from RoastLog. More to come! We continue to create features to help inform your business decisions.